Blog Festive Tex Mex Fiesta! The Tex Mex Challenge? Finding the perfect balance of the WILD WILD WEST seen in Texas and a Mexican Market! 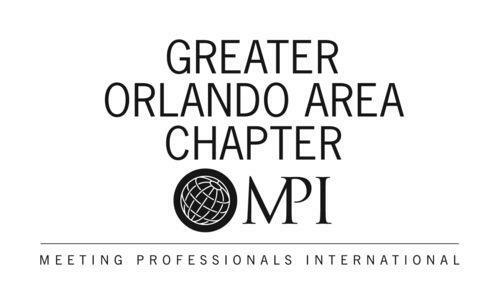 The MKE team took the challenge, conceptualized the vision with Executive Producer Janice Stephens, and executed a colorful event environment rarely seen in the halls of Rosen Shingle Creek! 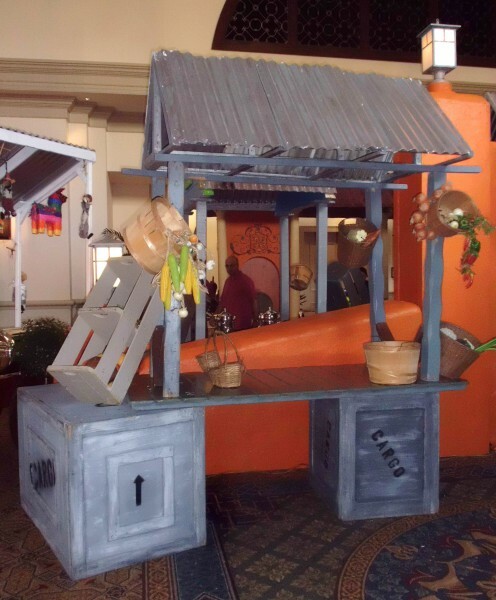 The prefunction area was centered with a Mexico-inspired market concept we dubbed “Mercado Calle Central” Marketplace. Vendor carts and market stalls were decked out in various market wares, faux produce, pinatas, serapes, and the like, to give the authentic feel of a bustling market. The best part? The stalls and carts were used as actual, functional food stations! 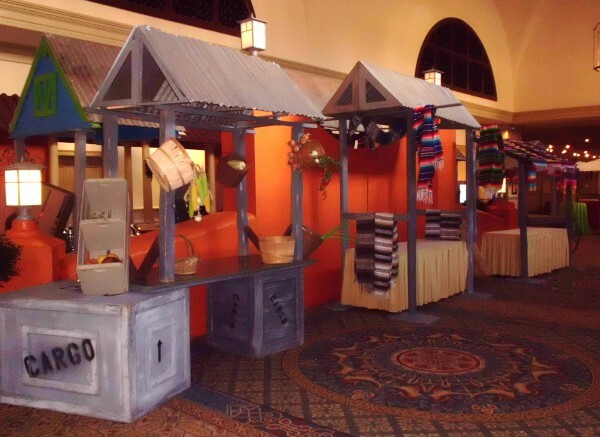 Centered between 2 rows of vendor stalls was 34′ of double sided, faux adobe wall, complete with working themed light fixtures. 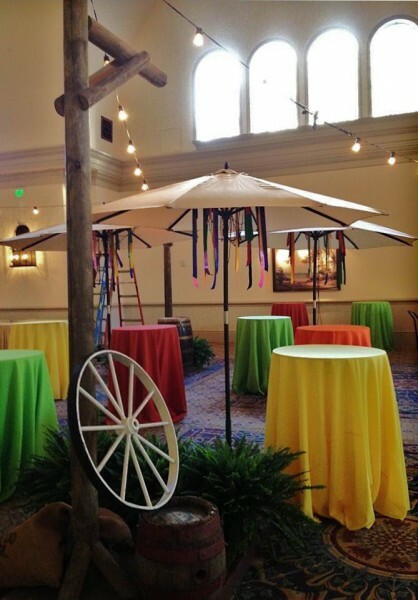 Natural color market umbrellas were given a vibrant punch of color with a simple treatment of ribbon streamers hung from the wood supports. A cluster of the umbrellas were assembled on each side of the “Mercado Calle Central” to serve as the primary feature amongst the cocktail tables, all dressed in lime, orange, lemon, and burnt orange linens. A “zig zag” pattern of string lights was assembled over each of the cocktail areas to add the perfect amount of atmospheric lighting to the space. No detail was forgotten-even the rustic timber post supports were dressed with “tex mex” trimouts! 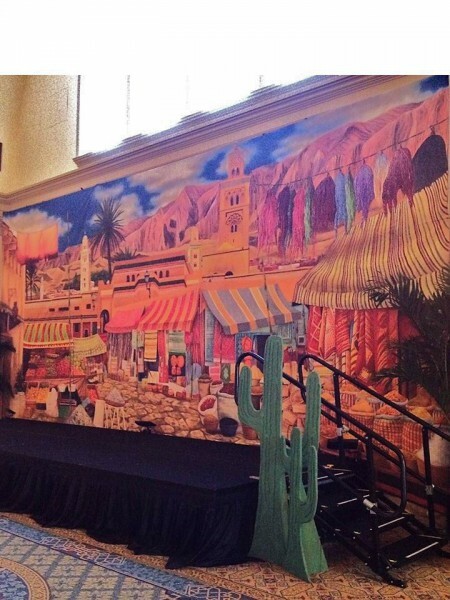 A “street market” backdrop from Backdrops Beautiful set the perfect scene for the Mariachi band entertainment. 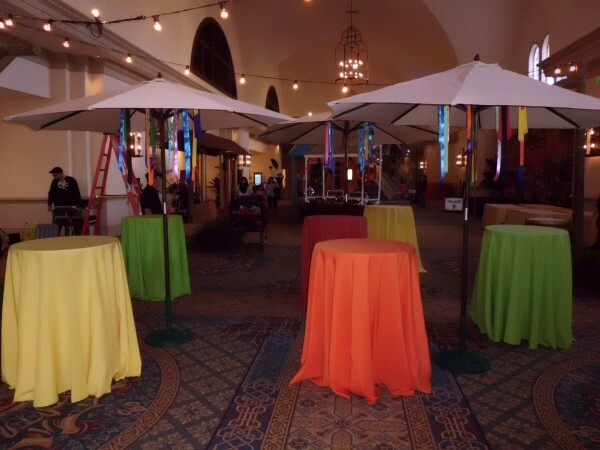 Simple and colorful, it complimented the dimensional decor throughout the prefunction area perfectly! 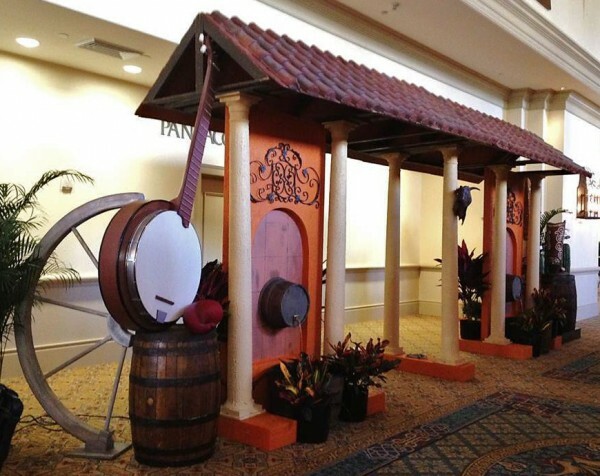 As the guests ventured from the market stalls and vendor carts from the prefunction area into the ballroom, they passed through the faux adobe treated entry piece, complete with stucco columns supporting the rustic terra cotta tile roof. Authentic barrels became impressive, active fountains to add to the ambiance. Flanking each side of the central entry were a cluster of over-sized accent pieces reflecting the “western fiesta” environment, including a giant banjo, over-sized peppers, and a huge acoustic guitar neck! MKE created ballroom perimeters, titled “The Great Southwest” Panels, to blend specific elements from the “tex mex” concept into a seamless vignette idea. 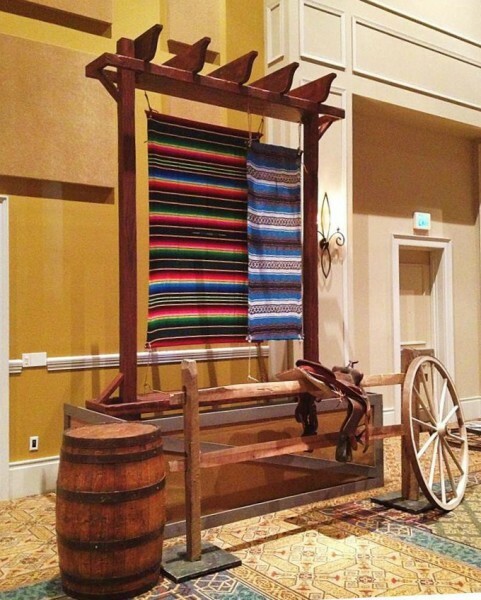 Massive frames were created to reflect a ranch timber look, and were used as the structural supports to hang dual colorful serapes in two different styles and sizes, suspended from hemp rope. Fronting each of the elevated frames were split rail fence sections paired with themed trim outs of faux cactus, saddles, and wagon wheels! 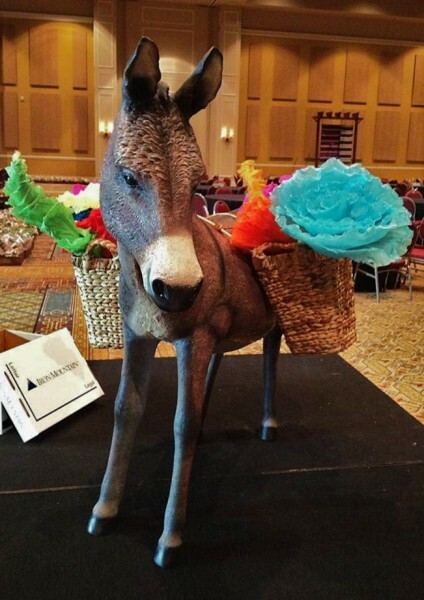 No “tex mex” market is complete without an adorably, adorned donkey! Even he (or she?) 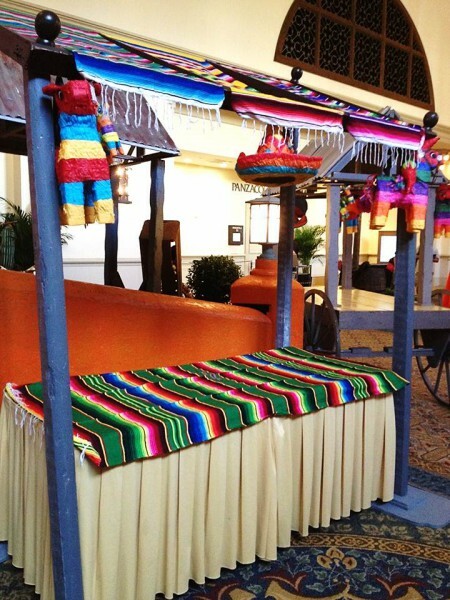 dressed to the theme with a draped serape and baskets full of Mexican paper flowers!